One National Worry each Zimbabwean must be asking themself is "How can we get a genuinely Trustworthy President after Mugabe's 38 years of Headmastering the Nation into 100% corruption?" If we became true to ourselves and admitted that we have ALL been bewitched by Zanu leadership since 1980, to become a corrupt and disprogressive Society, we would also find a remedy for our Nation. Imagine a country where, depending on who you are in the political spectrum, $10 can buy you ten loaves of bread, or the same $10 can buy you three loaves. The privileged one whose $10 can buy him ten loaves, earns a thousand times better than one whose ten dollars can buy him only three loaves. He has properties amounting to Billions of dollars and he has access to take unlimited amounts from National Coffers. In that situation, no amount of hard work, creativity, patriotism, prayer or miracle can turn around Zimbabwean economy. This is the normal that we learnt from His Excellency Former President Robert Mugabe and his entire team that was marked for unlimited and unaccountable privilege. 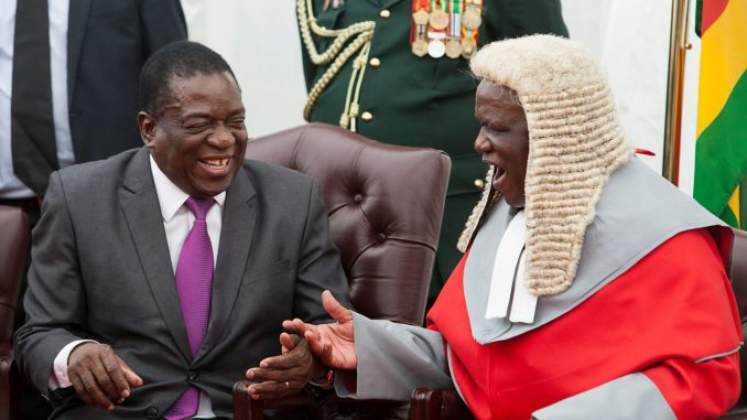 When President Mnangagwa came in, he preached that every Zimbabwean who externalised cash had been given an ultimatum to bring that money home. President Mnangagwa promised the Nation that corruption had reached its terminal point starting with the Police who had gone too mad. The Nation, and the entire World begun to see a miracle happening in our life times in Zimbabwe. We saw SOME corrupt Ministers being arraigned in Courts. National trust grew and the country begun to stabilise economically. Trustworthiness proved for that moment, that Zimbabwe needs only that. It is destressing to write about what happened next. Today as I write, Mugabe's own corruption and how the country perceived him as the worst man to have led our country since Matope in the 1200s, is just a tiny case compared to his predecessor. People do not know how much to ask as a living wage. People do not know how much they are worth? People do not know whether to laugh or cry. Businessmen do not know whether they are rich or poor. The amount of deceit and pomp leaves everybody frozen into a living mummy. It is just a wait and see kind of life where one does not even know the price of his cow. Patience has run out even for people who ecstatically celebrated the fall of Mugabe. The people cannot demonstrate to show the Government their anger. If they do, with Mnangagwa, they get shot dead by thieves who steal guns and army uniforms from armouries. Those items only get stolen if there is a strike. As a result, the Mnangagwa Government fears no one. They don't fear strikes because strikers are afraid to be shot. They do not fear anyone and anything and they are the freest group of corrupt thieves in the World, who can do what ever they like. All progressive Governments in the World FEAR THE PEOPLE WHO MIGHT STRIKE AND CRIPPLE THE GOVERNMENT. That essential tool no longer exists in Zimbabwe, if it happens, rogue people will go into the armoury and steal Army guns and uniforms, and shoot the strikers. You wake up to read that the Government is planning to confiscate Jonathan Moyo's properties for crimes he has not been arraigned in the Courts for. The President CAN find someone guilty, by the strength of his unmistaken imagination. That is how the Law has become in this untrustworthy regime. It is for every Zimbabwean to think deeply, on how we can source a President who was not slowly taught to see corruption as a normal thing in Zimbabwe. A Trustworthy President who fears the consequences of poor leadership, an upright man who accepts none of corrupt practices, an honest person who would be willing to punish himself over a poor judgement in a position of trust. President Mnangagwa has failed this hyped National Expectation and everybody knows that, like in the teachings of President Mugabe, President Mnangagwa will never resign. We are now much, much deeper, into the hot mud.